Lazy Loverz | Changing the world one lover at a time. I’ll be the first to admit that I use to tell my friends EVERYTHING in my past relationships. I would have an argument with my boyfriend and literally call my friends as soon as I would hang up with him. And I didn’t just call one friend, I would call multiple friends and tell them the same story. One particular time I actually forgot that I had told my friend already, called her again, and her response was, “Mesa, you told me this already.” I felt foolish, but I could not stop. I realize now that I honestly didn’t vent to them for any other reason than for them to have my back and validate that I was right in the situation. I never called or told anyone about the fights we had where I was wrong or could be perceived as wrong, but I always vented when he was the culprit. I noticed that after the talk I would be even more upset and start spewing off really hurtful things because in my mind my friends had validated that I was right and sort of “pumped me up”. Let’s be honest, your friends really don’t want to hear it. Yes, I said it! You friends do not want to hear every single time you and your significant other have a fight or disagreement ESPECIALLY when all you’re going to do is stay with them and continue the same behavior. If you and your partner are constantly arguing about the same things and you tell your friends, nine times out of ten they are rolling their eyes on the other side of the phone or text. They have given their advice many times and you still don’t get it. Don’t get me wrong, I think it’s perfectly okay to seek advice from friends who are in HEALTHY relationships or who can give you spiritual advice, but not everything needs to go to them. When you take all the bad things to your friends they develop a dislike for your partner and then you have the added problem of convincing them that your significant other “really is a good person”. Cut down on the bad talk about your partner and only take things to them that you’re a mature enough to handle when they tell you what you did wrong. Keeping things “in-house” strengthens your relationship. In my opening paragraph I stated that I had run and told my friend why I was upset before I even told the person who I was dating. And let’s be honest, all of us have done this before. They say something in the car ride home and instead of talking about it you immediately whip out that phone and start texting like you are running a marathon. AND THEN, this is my favorite, when they ask you what’s wrong, your response is “nothing” or “I’m fine”. (My boyfriend is reading this and shaking his head because I am famous for the “I’m fine” responses.) There is nothing wrong with taking time to cool down and gather your thoughts, but don’t involve other people before you tell your partner what is bothering you and give them the opportunity to move forward. I have learned that when you only work it out with your partner then you guys develop a strength that is not very common in today’s society with social media being as prevalent as it is today. You become a lot closer because you aren’t bringing in the opinions of Tina, Ricky, and Dina. Know the difference between bragging and acknowledgement. I read something on Facebook the other day that read, “People who brag in their relationships are really insecure.” I immediately took offense primarily because I am a huge proponent of giving people their flowers while they can smell them. I do not think you are bragging if you make a status about something nice your significant other did for you or someone else. In a world where we tear our significant others down via social media all the time, I find it refreshing to see someone post something nice about their partner, especially when it is not excessive. When you truly find someone who loves you and makes you better you really do want to scream it from the rooftop, but you have to learn the balance. Keeping it “in-house” refers to acknowledgments too. You don’t have to share every time he brings you flowers or the tickets she got you to your favorite sporting event. Keep some things between yourselves and you will appreciate you because the joy you feel when posting will instead transfer for your partner to feel. In summary, I would be lying if I said I didn’t share things with my friends about my relationship, but I can say that I don’t share everything and I honestly don’t want to anymore. I want secrets and memories that I just have with my boyfriend and there is nothing wrong with that. It is a clear sign of maturity when you choose to talk it out with your significant other and not your friends. After all, you guys are a team. Teammates don’t solicit advice from the spectators when they are in a jam. Learn to keep things private and watch your relationship flourish. I can remember when I first started my current relationship. I was so excited that we had taken the step from friends to lovers. I thought I was ready, no I knew I was ready for something new and exciting. For the first time I felt like I could truly trust a person with my heart. And then my insecurities reared their ugly heads. I thought I was over everything my ex had done to me, but truth be told I was not. I still had scars and bruises that I had tried to cover up. I learned that I was broken, and I never knew how broken I was until I got into a good relationship. That’s what insecurities does to people. It makes them remember all the bad even in the mist of everything good. You can be the best boyfriend/girlfriend a girl/guy could ask for, but insecurities will come in and tell you that it’s too good to be true. Not only will insecurities make you think they are too good to be true, but they will also cause you to think that you are not worthy of this good thing. That’s when trouble starts and you start to sabotage a good thing simply because you are use to things going wrong. You cannot even enjoy the present feelings because you have calculated in your mind that something will go wrong in the future. We are sometimes so consumed by our insecurities that we do not realize that our significant others are struggling to stay afloat. A good partner will literally do and say everything they can to help you, but if you do not first recognize the insecurities and then vow to change them then nothing will be resolved. It’s okay to tell them that you are scared to give them your heart or that sometimes you do not always believe them when they say they will not hurt you. Communication is vital in any relationship, but more important in those where one or both partners are insecure. It is okay to be vulnerable to the RIGHT person. It is okay to feel safe with someone who has proven time and time again that they are trustworthy. One of the biggest pieces of advice that I can give someone who is battling insecurities in a relationship is that YOU ARE WORTH IT! You DESERVE for someone to treat you right, you’ve kissed enough frogs and now you are experiencing your Prince/Princess. God wants you to know that you deserve everything that he has blessed you with and don’t make him a liar by rejecting the thing that YOU ASKED FOR. You cannot ask for a good man/woman and then when they come you ruin it with your insecurities. For those people who are dealing with an insecure person, recognize that the problem is not you. One of the biggest problems you will verbalize to your partner is that you have not given them a reason to not trust you. Well I challenge you today to change your thinking and give them reasons to trust you! Insecure people do not go into any relationships trusting, it has to be earned. Be patient with them, we all have flaws so work with them to fix the insecurities. I know sometimes it can be frustrating especially when you feel like you are doing everything right. It’s easier said than done, but do not take it 100% personal and keep in mind that their past has shown them that people are not trustworthy and to never give them 100%. It is up to you to change that and show them that true love is real. In summary, “sometimes our thoughts are backed by so much insecurity, that they create lies we believe.” Start believing that you are worth it and that you deserve to be truly loved. The rest will work itself out. This is crucial when arguing because we all have the tendency to sometimes justify why we are upset because of something that happened months or even years ago. For example, if you are angry because he forgot to put the toilet seat down then talk about that. Don’t bring up that fact that he did not open the car door for you last month or that he ignored you during the Super Bowl two years ago. When you start adding extra baggage to hurt feelings the result is an argument that went from 0 to 100 real quick. Don’t hit below the belt. This one is hard because it’s sometimes our natural instinct to hurt someone who we feel is hurting us. STOP. NO. DON’T. Do not bring up things from his/her childhood that you know are a sensitive subject for them and do not say things that you know will hurt them. We all know some things that will push our partner’s buttons and hurt them When this happens things turn from a simple argument or disagreement to a bashing session where feelings are hurt long after the argument is over. Fight fair and remember that you love this person. “I know I hurt you, but it’s because I feel like you keep hurting me.” Sound familiar? When you partially take the blame and point out the blame in others you are justifying your wrong actions. Take ownership for what you did wrong and let your partner acknowledge what they did wrong. Do not water down your mess by exposing “the reason” you did something. If you are in a mature relationship then both of you should know how to take responsibility for your wrongdoings without exposing the infirmity of your partner. I promise you if you add this suggestion into your relationship your arguments will be finished in half the time. When I was a little girl I was obsessed with fairy tales. Truth be told I kind of still am. There was something so magical to me about a man coming to declare his undying love for a woman, sometimes one that he had just met. So where did we go wrong? I’m sure we have all asked our man, “Babe why do you love me?” or “What do you love about me?” His answer: I just do or I love everything about you. -____-. And then we get mad and overthink everything and say, “OMG he really doesn’t love me.” Don’t lie, we have all been there. So why do men have a hard time telling you that they love how you support them or the way you walk or that you are the best thing that has ever happened to them? I should probably insert something here that gives a thumbs up to all of the ladies who hear these things regularly. Either he’s emotionally intact or you’re one heck of a girlfriend. But for everyone else who finds it hard to get your man to really say how he feels let’s look at some reasons and solutions to why he is not opening up. I know you don’t want to hear about anyone else being with your man before you, but we have to go there for a moment. Maybe your man started out as one of those lovey dovey of men who expressed their feelings all the time, left notes throughout the house, and just always said what was on his mind and in his heart. And then (insert scary music) Kiesha came along. Most men have experienced a Keisha in their lives. The one they gave their heart to and she played them. Now he’s scarred and is scared to let down his guard with another woman. He doesn’t want to seem weak and vulnerable. Women by nature are emotional creatures and men are well let’s be honest they are not. They can literally slam their fingers in the door and say, “It’s all good” whereas when we chip a nail it’s armagedon. Most times men view expressing feelings to a woman as being weak. Crazy, right? It’s very true. They want to remain macho and their pride allows them to put on a front sometimes even if his heart is bursting with heart emojis for you. Yup, I said it. Sometimes the reason he is not opening up to you about how he feels is because of you. Maybe you pressure him too much or he feels like he always has the wrong answer to your questions. Maybe you are trying to change him and he has literally shut down and won’t allow you in anymore. So now that we have explored some reasons why he may not express his feelings let’s look at how to get him to express them. Don’t just tell him, show him that he can trust you with his heart. Be his biggest supporter, his best friend, and his confidant and I promise eventually he will open up and tell you what his heart feels for you. A man will express how he feels for you when he is ready. You cannot rush him or speed up the process. Allow him the time he needs and not what is convenient for you. If he confides in you that he has been hurt and is scared, ladies do not abuse that information. If and when a man confides a secret to you or something that he is embarrassed about admitting KEEP IT TO YOURSELF. Do not tell your girlfriends or even worse do not bring it back up in an argument to hurt him. Trust me. In summary, the most sincere feelings are the hardest to be expressed by words. I still feel butterflies in my belly when I think of you. As if I swallowed cocoons for spaghetti, I still feel butterflies when I see you. From the core of me I shine because you inspired divine energy. You replenished a faith that was faltering with your golden satchel of mustard seeds. The Real is one of my favorite shows on daytime television right now. I love how five spunky ladies, all from different backgrounds, come together and talk about today’s hot topics. The other day I was watching and an audience member asked a really interesting question. She wanted to know what boundaries you should set for your partner when they are going out on the town with their friends. Before the ladies gave their opinions I went into flashback mode and remembered all the ridiculous boundaries I tried to set in previous relationships. “Don’t get anyone’s number.” “Don’t cheat on me.” “Respect me.” Looking back I see how crazy and insecure I was to even set “rules” for my significant other while he was out with his boys. I learned something really important about making rules when your s.o. goes out without you..DON’T! Simple, right? I’ll directly target my ladies on this one. Stop. No. Don’t. Ladies, if you have to tell your man not to cheat on you or to respect you when he is out with his boys then you probably should not be with him. A REAL man/woman knows how to go out with friends, have fun, and respect you all at the same time. If you are like me then you secretly do not like when your s.o. goes out without you (be honest) especially when you view them as your best friend too. And if they have fun without you? (insert scary music lol) The thought of him having fun without you is not a good feeling, but he cannot be with you 24/7. Maybe I’m alone in this one, huh? I learned that I had to let my s.o. go out with his friends and LEAVE HIM ALONE! You’ve probably stopped reading after that, but if I still have your attention just hear me out. I have learned from experience that when a woman is encouraging and supportive of her man going out (not excessively) and does not text him every five seconds then she is on his mind more. When you let him have fun alone then nine times out of ten he will realize how much he misses you, text you frequently, and skip the after party with his boys to come home to you. No man wants to come home to a nagging women so if you have complained all night about him being out do not expect him to hurry home and shower you will love and affection. LET HIM BE. This applies to you too fellas. Let her enjoy her time without you so that when she does come home all she wants is to be around you. SN: There are acceptable “rules” to give your significant other when they do go out. 1. Let me know when you get there. 2. Let me know if plans change and you end up somewhere else. 3. Let me know when you get home safely. Let’s be honest, we live in a crazy world so checking the safety and well being of your mate should always be acceptable. SN: If he/she forgets to text you when they get to their destination do not trip, simply send a quick text to check in, but DON”T KILL THEIR VIBE. In summary, if you have to constantly to worry or set boundaries about him/her going out then you need to reevaluate yourself first (maybe some hidden insecurities) and then the relationship itself. A good bf/gf should never have to be told how to behave when they are out of your presence. Give them the space they need. After all, absence makes the heart grow fonder. One of my favorite shows is “A Different World” primarily because of the relationship between Dwayne Wayne and Whitley Gilbert. Whitley and Dwayne had a rocky start, but somewhere in Season 5 they decided to take their friendship to the next level and get into a relationship. If you watch the show then you know that Dwayne and Whitley decided to end their engagement primarily because Dwayne went on a date with another woman, but also because he and Whitley weren’t as compatible as they thought. Since they had all the same friends and still worked closely together they decided to stay “friends.” Let’s be honest people we all have ended a relationship with the same conclusion: we will always be friends. 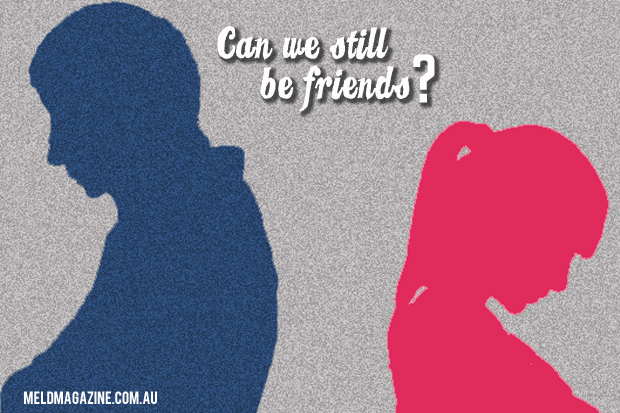 But is it really possible to be friends with an ex? Webster defines a friend as, “a person whom one knows and with whom one has a bond of mutual affection, typically exclusive of sexual or family relations.” I think Webster hit it right on the head. It’s not possible to be friends with someone you have been intimate (emotionally, mentally, or physically) with…immediately. Hear me out for a second. When I think of my friends I think of people I can call no matter the time of day with my joys, fears, and drawn out love stories. If you end a relationship with someone and you do not feel comfortable talking to them about another guy/girl then you are not ready to be true friends. Even if you feel comfortable, if they are not ready to receive that information without hidden anger or jealously then they are not ready to be your friend. With time, SPACE, and self reflection I do think it is possible to be friends with someone you have dated in the past, but past is the keyword. You cannot be true friends with someone you just dated two weeks ago and if you can then you didn’t invest much into that relationship.I think as young people we are naive in thinking that someone we have invested so much time in will always be around when the sad reality is that time invested is not always good time. If you have an ex and you want to truly be their friend you have to give it time. When we rush from relationship to friendship we end up hurt or falling back into a relationship we wanted out of. For example, you broke up two weeks ago, but because you decided to be “friends” you still text or talk everyday. What’s the difference? I’ll tell you…nothing. One or two things will happen: 1. You will end up back into the relationship or 2. You will end up hurt even more because your emotions are tied to someone who is not technically yours anymore. TAKE TIME! Towards the end of Season 5 Whitley meets Byron Douglas, a state senator who knocks Whitley off of her feet. Dwayne realizes that he cannot be just friends with Whitley because he still loves her and hates the thought of her being with someone else. He even goes as far as stopping their wedding and asking Whitley to marry him mid ceremony. Of course this is a show, but the point is if you cannot stomach the thought of your ex being with someone else then you are not ready to be their friend. So you had a fight? Take a breath, remain calm, and relax. Every relationship goes through arguments, disagreements, and fights (not physical, that’s not cool). So how do you deal with that period after the storm? You know the moment before the calm comes when you are still angry and you may be thinking about doing something or saying something you may regret in the future. It’s hard not to want to retaliate especially when you feel wronged by your significant other. 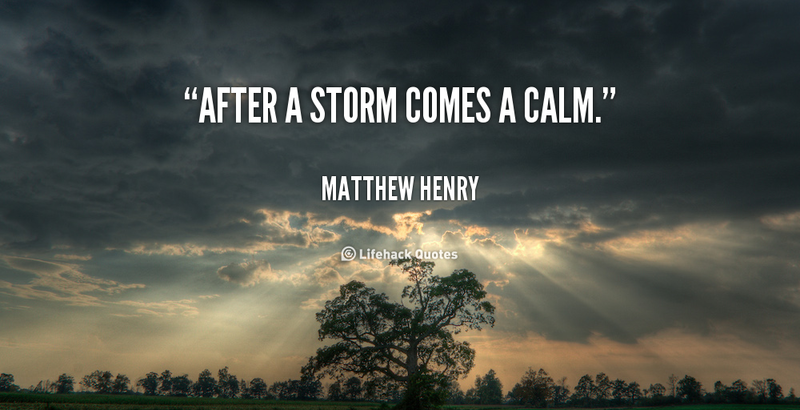 Let’s explore how to handle that time after the storm. In past relationships I always had to have the last word. (My boyfriend would argue that I still do LOL.) I had to realize that everything I was thinking or feeling was not appropriate to say so now I TRY to end the conversation before things escalate too far. There is nothing worse than intentionally trying to hurt someone who hurt you. Two wrongs never make a right. When we talk, yell, and scream out of anger we end up regretting it in the future. Take some time to calm down, regroup, and analyze your part in the argument. Remember that you love this person. I know I am not the only one who ends a phone conversation and then realizes that I forgot to say something and texts it when the heat is still high. STOP. NO. DON’T. A text message is never the right way to discuss something important because texts do not come attached with tones and emotions. It is very easy to read a text and misconstrue what the person means especially in, during, or after an argument. You don’t want that old thing back! I can remember a time in my younger and naïve days when I use to have an argument with someone I was dating and when he would upset me I would reach out to an old flame. This is the NOT the answer. There is a reason you left that guy/girl in the past and do not forget that reason. You and your significant other maybe fighting for a moment, but what seems like forever will be over before you know it. You do not want to be back on cloud 9 with your “boo” and then trying to juggle texting your ex on the side. It creates drama and mess that you both do not need. The calm will soon come. I know it’s hard when you have an argument with your significant other. Especially when it happens on a day when you have absolutely nothing to do or at night when your normal routine includes talking to them until you both fall asleep. The great thing about a healthy relationship is that one of you will eventually try to make amends with the other. When that time comes be respectful, listen, and agree to move forward.